In this installment of the Technology and the Arts podcast, we share some interesting news, web sites and online resources we have come across recently, including spreeder, ma.gnolia’s decision to go open source, and our own John LeMasney’s “prevail whale.” Plus, we discuss some interesting sights on Google Maps Street View and Google Earth and a possible last stand for Pandora and the webcasting industry…and more! Hosts: Brian Kelley and John LeMasney. File size: 17.5 MB. Time: 37 min., 09 sec. FriendFeed.com/lemasney – John LeMasney’s FriendFeed profile. lemasney.com – John LeMasney’s Web site. FriendFeed.com/bktandem – Brian Kelley’s FriendFeed profile. Spreeder.com – A free online speed reading application. FoodGawker.com – A site devoted to beautiful food imagery. FaceYourManga.com – John refers to “Manga Me” in the podcast, but I believe this is the site he used to create his anime likeness…that’s the one I used after he talked about it. But if John wants to correct any of this, I’m sure he will. 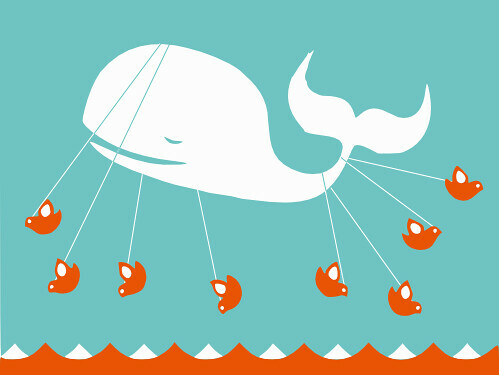 “prevail-whale” – John took the infamous Twitter “fail-whale” and turned it into a symbol of success (see photo above)…and it got noticed around the Internet. John’s Southern Tier Back Burner review – Here is his opinion on this barleywine style ale on one of his side projects, beercritic.wordpress.com. Grand Welte Cottage Orchestrion – Check out this musical playback device from the early 1900s that Brian saw in action at the Asa Packer Mansion in Jim Thorpe, Pa.
Classic “Doctor Who” on iTunes – Some episodes of the original “Doctor Who” series from the 1970s and 80s have made their way to iTunes — even for Americans — and some of these are not even available on DVD yet. Happy Birthday, iMac! – August 15 marked the 10th anniversary of the release of the original Bondi blue iMac. DIY Indie Bands in the Digital Age – Ars Technica reports on how indie bands are using resources available to them in the digital age to make it without help from record labels. ScanMyPhotos.com – The New York Times’ David Pogue reviewed this service, which scans your old photographs and puts them onto DVDs, and had good things to say about it. Some strange things can be found on Google Maps Street View, like a drunk guy passed out on a curb and a house burning down. Also, check out The Strangest Sights in Google Earth. Pandora to pull the plug? – Pandora’s Tim Westergren recently told The Washington Post that the Internet radio service was on the verge of making a “pull-the-plug kind of decision” in the face of increasing royalty rates. Also, check out this story…and this one…and for more on the plight of webcasters, visit SaveNetRadio.org. I guess the battle to save Internet radio being waged in Washington, D.C., proves that common sense — for the most part — doesn’t really exist within the infamous beltway. Apparently, the efforts by our friends at Pandora and other music webcasters to come to an agreement on lower royalty rates other than those proposed by SoundExchange and approved by the Copyright Royalty Board last year have gone absolutely nowhere. For more about the battle to save Internet radio, visit SaveNetRadio.org. Ordinarily, I try not to upstage the podcast posts for at least 24 hours, but I have to make an exception this time. Why? Because I wanted to give the following event a plug during the podcast and forgot to do so…and it’s tonight so it really can’t wait. OK…here’s the deal…tonight at the Gershman Y at 401 S. Broad Street in Philadelphia (Google Maps), a really cool guy I know by the name of Matthew Borgen is taking part in a First Person Arts Salon event. He will be talking about “The Wing Rack,” a multimedia, autobiographical installation he exhibited at the 621 Gallery in Tallahassee, Florida, a few months ago. Matthew will be speaking along with other artists during the program. Beer (made possible by Flying Dog) and refreshments available for donation. Visit this web site for more information. I wish I could attend, but I have a work commitment tonight (it’s just attending a Trenton Thunder baseball game, though…it’s not like I’ll be doing any work). In this installment of the Technology and the Arts podcast, we share some interesting news, web sites and online resources we have come across recently, including the disastrous launch of Apple’s Mobile Me online services and the brilliance of and the controversies surrounding the opening ceremonies of the 2008 Olympics in Beijing. Plus, we discuss the recent passings of a trio of entertainers: Isaac Hayes, Bernie Mac and Philadelphia singer-songwriter Robert Hazard…and more. Hosts: Brian Kelley and John LeMasney. File size: 11 MB. Time: 24 min. FriendFeed.com/lemasney – John LeMasney’s tumble log. FriendFeed.com/bktandem – Brian Kelley’s tumble log. John was unable to record this week’s podcast, so it’s just Brian going solo. However, here are some links to John’s FriendFeed profile and other projects: BeerCritic, NJ Dining Review and his reviews on Yelp.com. He has recorded an accordion part and backing vocals for a bluegrass version of Twisted Sister’s “I Wanna Rock” for his friend, singer-songwriter Christian Beach. The track will be appearing on the upcoming Main Man Records tribute to 80s hair metal. Also, here are some photos Brian has taken at some of Christian’s shows this summer. Brian and his girlfriend, Alison, spent time with Brian’s longtime friend Jason Pester, who is visiting his home state of New Jersey from his current home state of Colorado. They saw the movie “Hancock,” which was not as bad as Brian expected, and played miniature golf…Brian won…again. 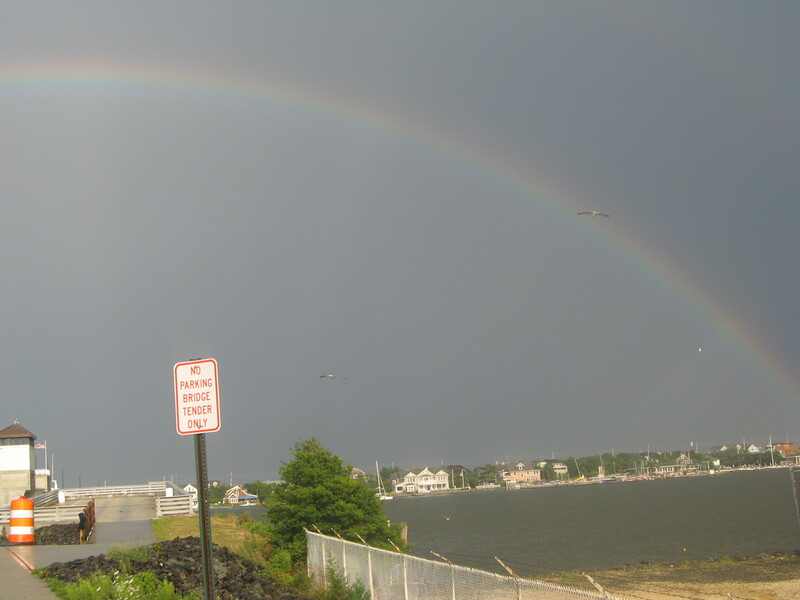 Also, the three of us saw the amazing rainbow in the photo above. The opening ceremonies of the 2008 Olympics in Beijing were amazing…however, some of it was done with CGI and with a “cute” girl lip-synching a song recorded by a girl considered “less cute.” Also, a Microsoft Blue Screen of Death apparently made an appearance. Researchers claim to have made a breakthrough in developing an invisibility cloak. Apple messed up with the launch of MobileMe…and Steve Jobs ‘fessed up in an e-mail to Apple employees (that Ars Technica graciously posted for us all to read). Brian reflects on the recent passings of three entertainers: Isaac Hayes, Bernie Mac and Philadelphia singer-songwriter Robert Hazard, who wrote “Girls Just Want to Have Fun” and had an 80s hit of his own with “Escalator of Life” (see video below).